When we were making our way to Papua New Guinea for the first time six years ago we called in to see my good friend Lisa and her family. We hadn’t seen them for a long time as we our families had been living in different states and then Gorgeous Man and I had moved to South Africa. Lisa, through no fault of her own, had ended up with a lot of Very Hungry Caterpillar fabic and during that visit she cut me some pieces to take with me. I had a panel that I had bought in South Africa, but not the coordinates. About a year later I saw (for the first and last time) quilting quality fabric for sale in one of the stores here in Papua New Guinea and several metres of the white came home with me and I started cutting and sewing. I’m a slow quilter and it’s taken me a few years, but it’s finally finished. Behold in all it’s glory. 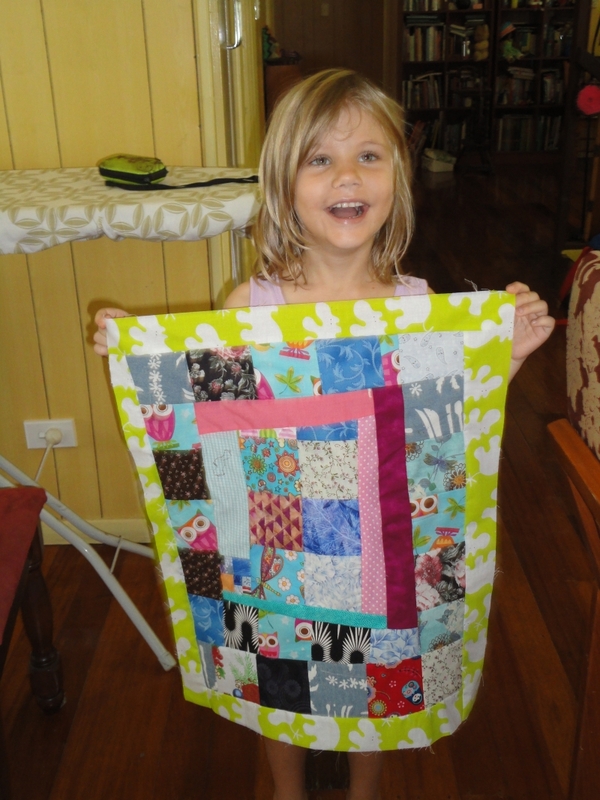 The quilting was done by Quilting by Fiona. This is the second quilt she has done for me and did not disappoint. 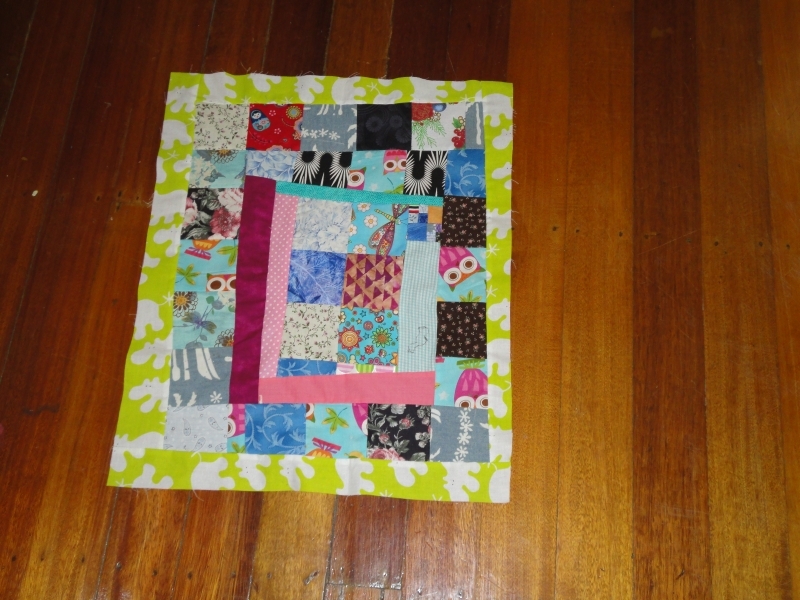 If you are in Australia I don’t hesitate to recommend her for quilting, she’s great to work with, reasonably priced and does an excellent job. I’ve dealt with her via mail and in person and both times went without a hitch. You can see her lovely work. We selected a pantograph that had a mix of stippling and butterflies to match the theme of the quilt. I’m so happy with how this turned out. 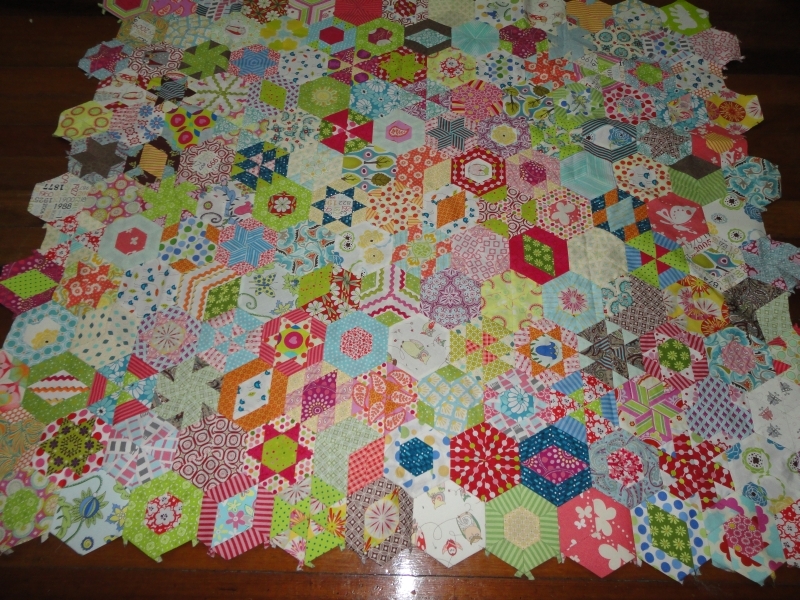 I have another centre panel and some left-overs, so a small baby quilt may appear at some point in the future. Huge thank you to Lisa for her contribution (and her husband for buying the extra fabric that she found herself with)! One final show and tell. I’ve been working on this quilt for a while. I think it’s nearly done. I want add one more white border around, but I’m avoiding the maths I need to do in order to work out if I have enough fabric to do that. I have a break from teaching coming up (mid-semester break) so perhaps I’ll have the energy to try it one evening after work (I still have to be in the office although there are no teaching classes). On Sunday Gorgeous Girl wanted to do all the crafts. We started off by putting some dye in the dye pots. She then went and played outside while they simmered away. We were pretty pleased with the result. All dyeing was done with food colouring. The pink was done by pouring cochineal on one side of the pot and rose pink on the other. 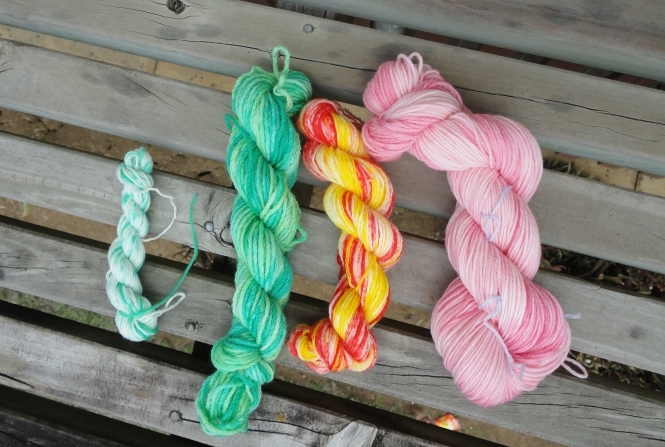 The red and yellow yarn was dyed in the cake. We squirted yellow into the centre of the cake and then filled the pot with water and red food colouring. The green was an attempt to do the same thing with yellow and blue, but some of the yellow spilled and we got this lovely green instead. The tiny bit of green and white was thrown in with the green as a ball of yarn to absorb some of the excess dye in the pot. After that I got ready to cut more fabric so I could keep working on my quilt, but Gorgeous Girl asked if she could sew instead. We decided to call this top finished. Craft blogger in the making? 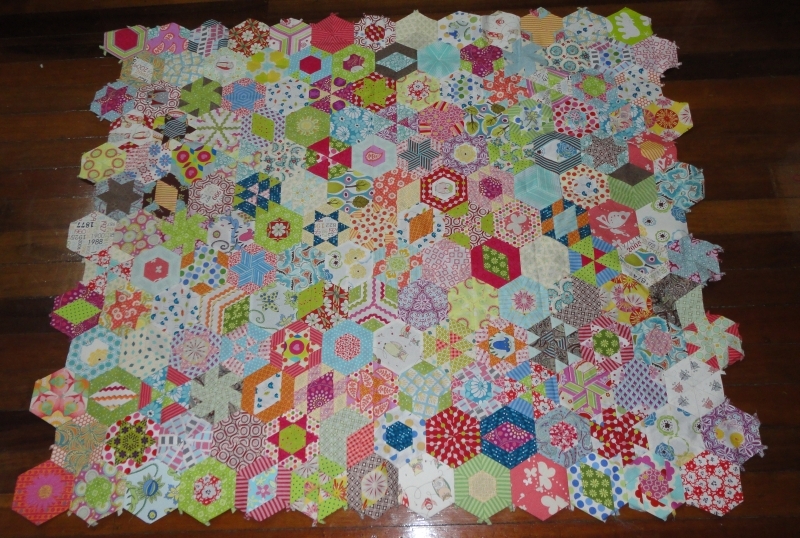 It was then time to start a new quilt top. 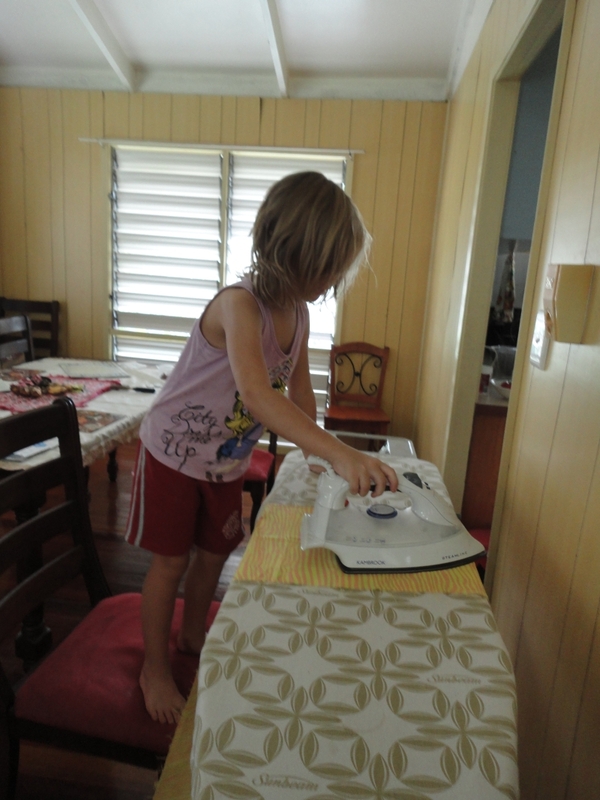 Gorgeous Girl diligently ironed the fabric so that I could cut it for her (I’m not about to let a 6 year old loose with my rotary cutter). She then gave me very strict instructions about what length and width to cut. It will be interesting to see where her design goes. Hopefully it won’t be another three months before the urge to sew grabs her.